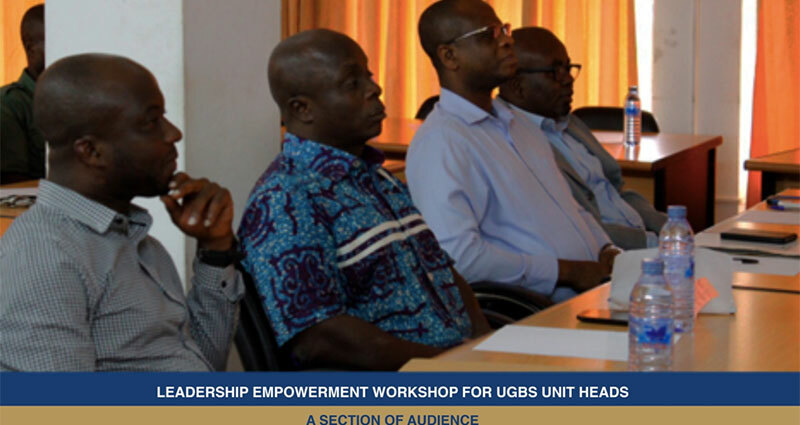 Prof. Robert Ebo Hinson, Head of Department of Marketing and Entrepreneurship, delivered a presentation on the topic, “Key Principles for Effective Management”, at a Leadership Empowerment Workshop organised for all unit heads and administrative secretaries in the School, on 8th November, 2018 at the Executive Hall. In his opening statement, Prof. Hinson welcomed all present to what he termed, “a short lunchtime session on Management”, which he said was going to enable the participants take better ownership of their responsibilities as managers. He walked staff through some crucial duties of the manager, which include managing work and resources, serving as ambassadors of the corporate brand they represent, amongst others. He explained the need for managers to have clear plans, budgets, deadlines and key performance indicators (KPIs) for their teams. Speaking on the obligation of managing the work, he stressed that good information flow was necessary to produce excellent work output. According to him, managers must ensure that their team members are always informed. Prof. Hinson highlighted some traits of good managers such as consistency, ability to make sound decisions, in-depth knowledge of the work, foresight, fairness and care for welfare of workers, which should be exhibited by all. In his closing remarks, he encouraged managers present to have timelines in order to be organised and also practice all the issues discussed to be efficient in their various units.